How Smart Is a Squirrel? You know how hard it is to hang a bird feeder in your backyard and keep the squirrels away. It takes a lot to deter them -- no matter what you do, they figure out how to steal a snack. Frustrating as it may be, it’s just one indication of how intelligent and adaptable these backyard critters are. While a squirrel isn’t going to pen the next bestseller or ace a calculus class, the squirrel is smart in his own way. When looking at animal intelligence, humans shouldn’t judge animals by human standards. The best way to judge animal intelligence is how well they adapt and make use of the world around them. Squirrels are experts at adapting, capable of living almost anywhere, so much so that in some areas they are viewed as pests. Memory and abstract thought are two hallmarks of intelligence that squirrels have proven they are capable of. Squirrels are quick studies, capable of learning by observation. In a study performed at the University of Exeter, squirrels would watch another squirrel remove a nut from one of two pots. The squirrels learned quickly that if the squirrel they watched took the nut, the pot would be empty and that going for the opposite pot was the better bet. When having to choose a pot without watching a fellow squirrel first, they showed no preference. Being able to learn by observation is an indicator of abstract thought. 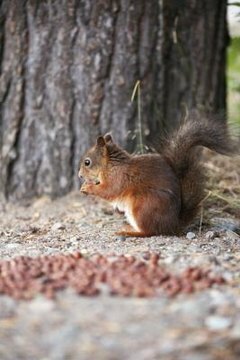 Squirrels bury nuts in order to have access to them later, a skill that’s not very helpful if they can’t remember where they hid them. Squirrels have shown they are capable of remembering where they have buried nuts. In study performed at Princeton University, grey squirrels were capable of using spatial memory to retrieve nut caches they had buried. They can remember good sources of food from year to year. Squirrels are also capable of memorizing the easiest route up a tree to get back and forth from their nests. If a squirrel comes across another squirrel’s cache of nuts, he’ll happily take them for himself. To deter would-be robbers, squirrels will rebury a cache of nuts over and over. Moving food around makes it harder for another squirrel to find the store. Squirrels will pretend to bury a nut if they know they are being watched and wait until they are alone to actually hide it. Being capable of actively deceiving another squirrel is a form of tactical deception, a skill once thought exclusive to primates. Squirrels: The Animal Answer Guide; Richard W. Thorington, Jr.